The Siesta Bar is great by poolside, lakeside or to create a backyard paradise. The Siesta bar has a 2’ overhang in front to create shade over the bar stools. 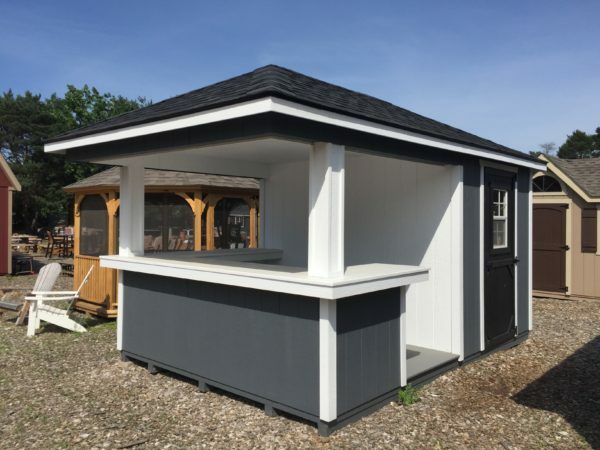 Very durable and low maintenance this is built like one of our sheds. Bar in the front and storage or changing room in back. Popular sizes are 10′ x 12′, 10′ x 14′ and 10 ‘x 16’ just remember the 2’ overhang adds 2’ to the size.